Over the last few days I’ve heard stories on the radio and on Facebook of people sharing their proud moments of being an American. Not a day goes by that I don’t experience more than one moment like that, but I wanted to share one moment worth remembering. 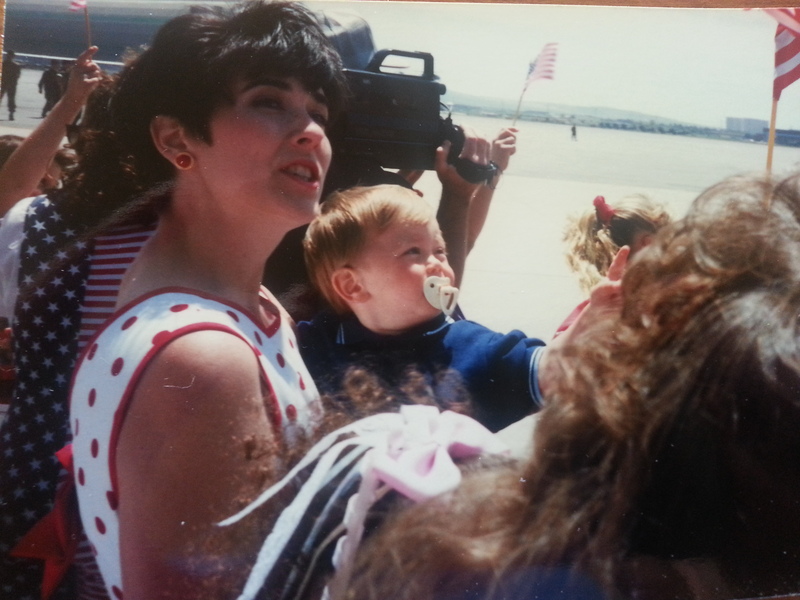 Twenty five years ago today I was in California with a six month old baby, waiting to hear whether my husband was still alive. My husband was part of the 13th Marine Expeditionary Unit that invaded Kuwait in Operation Desert Storm. You must remember that back then, only 25 years ago, no internet and no cell phones existed. When we needed to communicate, we exchanged letters. We had never heard the term “snail mail.” It was just mail to us, and it was vitally important. I wrote to Bruce and he wrote back, often our letters were delayed or later ones arrived before the first ones did which resulted in a confusing message. But we didn’t care as long as we heard from one another. I sent pictures of our growing baby boy, and he asked all kinds of questions. We only talked on the phone when he was in port, and then only for a short time because the calls cost so much money. Cable news had only one 24 hour news service then also, CNN, which I watched ALL the time for any news to indicate what was happening in Kuwait or even any word of where our Marines were. Throughout that ordeal of his being at war, the image that kept scrolling through my mind was Bruce standing on the deck of a harbor taxi in Singapore getting smaller and smaller as the boat took him back to his ship and far away from me. I clung to that memory and to our time together in Singapore, the last time we were together before the invasion of Iraq. When word came that the Marines were landing an invasion force on the beaches of Kuwait, I knew Bruce was involved. Like the rest of the world I had no idea the plan was to lure Saddam Hussein’s forces toward the coast so the Allies could cut off their retreat to Iraq. To do that they had to make it appear the Marines were invading via the beaches of Kuwait. Bruce flew a transport helicopter. I prayed for his safety and waited. Waiting is what military spouses do. We become very good at compartmentalizing our lives, in taking care of the business of living without ever forgetting our loved ones serving on the front lines or training to serve. We carry on. It’s what our lives were and still are in my case. We wait for our men to come home,and that’s just what my Marine did. 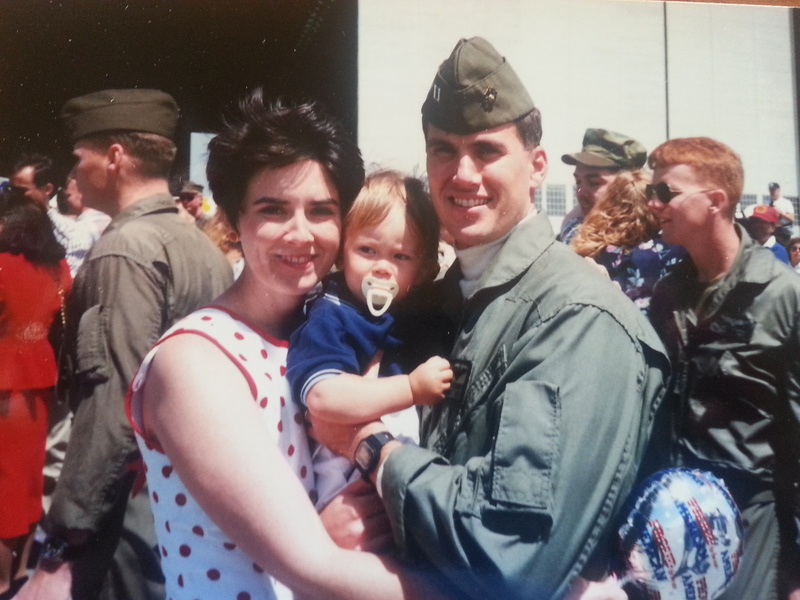 In April after ten months of deployment, Bruce and the rest of the Marines finally came home. His squadron was the last to return home after the war and were nearly forgotten in the news coverage, but not in our hearts. 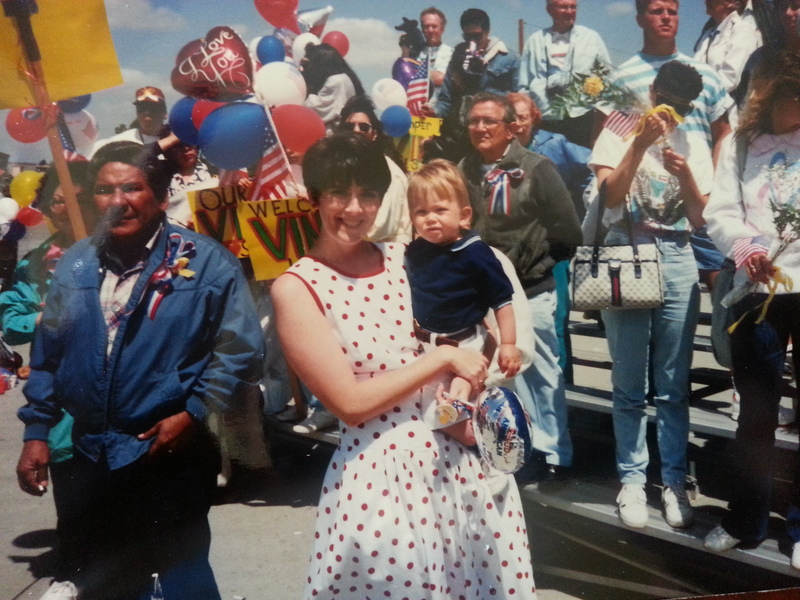 On that day, hundreds of family members and friends gathered on the flight line to greet our Marines as they flew in from San Diego to MCAS Tustin. 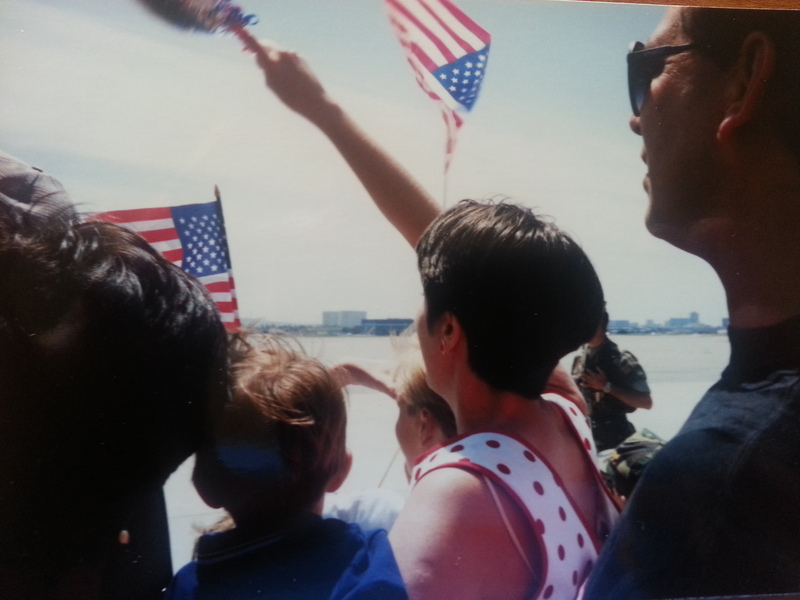 On this Independence day of 2016, I am very proud to remember a time in my life when time and freedom seemed more precious to me than at any other. We should always remember that freedom is not free, that others in this world suffer oppression and that men like my husband, and my son, are willing to sacrifice their time and their lives to protect our freedom. Freedom is sacred. I am proud to be an American always, but today, when I remember what my husband and many more like him all over the world came together to do, to free the people of Kuwait from Saddam Hussein, I am especially proud of them and that I was even a small part of that time in history.